I really like the windowpane block. Lovely colors, too! I love both blocks. Love the out of the box look of them. Awesome! I'm going to file this idea away for later. I probably wouldn't have put those fabrics together, but they work beautifully, and I love the window block you made! they both look great. I am so excited for sewconnected2!!! LOVE the blocks. Especially the first one. Great job. I love your blocks, especially that first one! The colors are so warm and calming. Hi John. You've been busy making blocks. Great designs. It's fun to create isn't it? Well, take care. I've been cooking and freezing for Thanksgiving so that I won't get stuck in the kitchen this year...LOL. love the fabrics you've used. fabulous blocks! 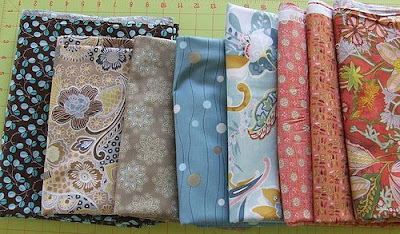 Very nice blocks - I really love the fabrics - she did a great job coordinating them! Hello, I just stumbled on your blog! Those fabrics are beautiful and I love your blocks! The first one is my favorite! those blocks are beautiful, i always admire someone elses bravery in cutting fabric with no plan...it always turns out great and modern too. Really beautiful patterns, each for it self. And the outcome, too, is very nice.